In 2011, Norman Doray took America by storm with the release of his debut mix compilation Strictly Norman Doray (Strictly Rhythm), single ‘Kalifornia’ and a subsequent tour. Now he’s currently riding a major wave for his remix of Kaskade & Skrillex’a ‘Lick It’, his brand new track ‘Leo’ for Spinnin’ Records and forthcoming tracks Norman Doray & Tokoto ‘Music’ (coming soon on Azuli Records),’Celsius’ with Eddie Thoenick (coming soon on Size Records) and ‘Something To Believe In’ with Nervo (coming this fall on Spinnin’ Records). 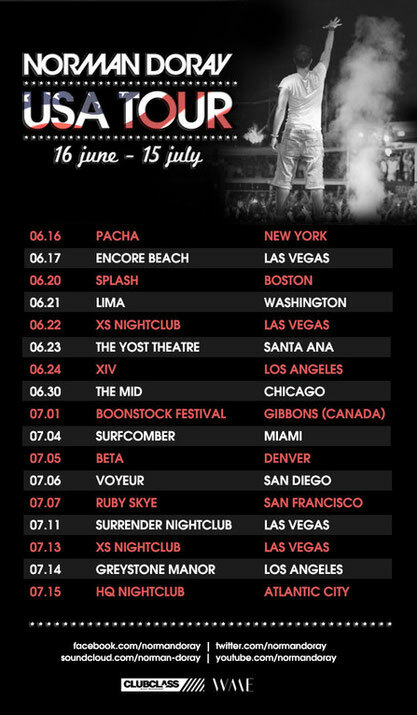 Norman returns to North America this week to kick off his biggest tour yet featuring stops in Denver, New York City, Los Angeles, Miami and Las Vegas; home to his residency with Encore’s XS, Surrender and Encore Beach Club properties. He’s responsible for huge tunes such as ‘Apocalypse’, ‘Last Forever’, ‘Tobita’ and ‘Chase The Sun’ and remixes for the likes of David Guetta, Dirty South, Laidback Luke, Tony Braxton. With his productions gaining such high exposure all around the world, Norman has become a popular DJ on a seemingly never-ending tour, he regularly touches down at MOS in London, Green Valley in Brazil, Ushuaia and Pacha in Ibiza, LIV in Miami, XS in Las Vegas, Playhouse in Los Angeles, Ageha Tokyo and Zouk in Singapore to name just a few locales. Not just a club DJ, Norman is also well accustomed to playing at the world’s biggest festivals such as ULTRA Music Festival (United States), Tomorrowland (Belgium), Midwest (United Kingdom), Sunburn (India) and Creamfields in the UK. Norman also has a strong presence in Ibiza every year, in addition to playing for Eric Morillo, David and Cathy Guetta regularly invite Norman to perform at their party concept F *** Me I'm Famous Ibiza and other events around the world. In April 2011, David Guetta asked Norman to play at the opening of his UK tour, allowing him to perform in some of the most recognisable venues in England. Norman was also given the opportunity to produce a remix of David Guetta & Taio Cruz’s ‘Bad Little Girl’ and is also often asked to play alongside the Swedish House Mafia. His dedication to electronic music has allowed him to develop with determination, talent, creativity and a love for the music. For more info, check Norman’s Facebook HERE.